Keeping homemade smooth hummus on hand in the refrigerator makes this come together very quickly and easily. Bring the hummus to room temperature (I take it out in the morning at breakfast) and loosen it up by stirring in a few teaspoons of water or lemon juice. This recipe is vegan, and gluten-free if you don't eat it with pita. 2. In a medium sauté pan, heat the olive oil over medium heat until hot but not smoking. Add the red pepper and stir to coat with the oil. Season with sumac, garlic powder, salt, and cayenne pepper. Continue to sauté until the pepper pieces are blistered and charred in spots, but still have some crunch to the texture. 3. Add the minced garlic and a tablespoon of the chili oil, and continue to cook just until fragrant, less than one minute. 4. 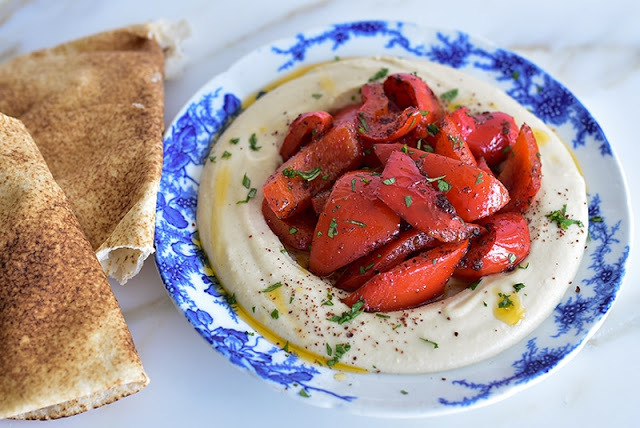 Spoon the pepper into the well of the hummus plate. Drizzle with the remaining oil and finish with a dusting of chopped fresh herbs. Eat immediately with pita bread, or all on its own.